Only just launching in January 2017, Fable Casino is very much a new kid on the block. Fable joins the growing club of casinos marketing themselves to the higher rolling online and mobile casino players, who are swelling in ranks as online gambling becomes a more prolific past time. Because it aims to appeal to the more discerning players, Fable recognises the need to offer only the very best in games, service, and of course, in bonuses. Though aiming high, Fable Casino is ideal for any sized wallet, and is sure to become a favourite of all kinds of players. Well, one easy answer to the question of why to play at Fable Casino is the £1,500 welcome bonus you are able to claim when you sign up. Another might be the 547 games on offer. How about the fact that at the start of each week, Fable will send you a bonus tailor made for you? Basically, what we’re saying is that Fable Casino is a multi-faceted casino, with plenty to offer anyone who decides to login and play. The extensive games collection comes curtesy of 16 of the most well-known and respected names is the online and mobile casino industry. The selection spans slots, table games, bingo, live casino and more, meaning that you’re guaranteed to find games. Though this might be enough to tempt any player into having a go at the casino, Fable sweetens the deal by offering bonuses worth thousands, and treating new and existing players like very valued customers. This is the really exciting bit about Fable Casino – the games. The fledgling casino has worked with ProgressPlay (whose platform the casino is built on), to put together an absolutely killer collection of games. Fable Casino may have only just launched, but even by the standards of more well-established casinos, it has an awful lot of games on its roster. In total (at least at the time of writing this review), Fable Casino boasted 547 games, which breaks down into 361 desktop only, with 186 of them being available on mobile. The biggest minority of the games on offer at the casino come from either NetEnt, Microgaming or NYX, but working with ProgressPlay and NYX means that Fable has access to the games of over a dozen other developers – including Thunderkick, Elk Studios, Lightning Box and NextGen – whose games bring all kinds of different themes and features to the site. All this means that Fable Casino is able to boast one of the most complete collections of online and mobile slots you’re likely to find anywhere, which it complements with a big selection of table games, roulette, lotto, bingo, and even an extensive live casino. When a casino is new on the scene – as Fable Casino is – they tend to have pretty inflated welcome bonuses on offer in order to attract in plenty of new players, but even though we’re used to seeing this trend by now, Fable Casino still manages to take it to the next level. This generous new casino is offering players the chance to pocket up to an extra £1,500 as bonuses on top of their first three deposits. 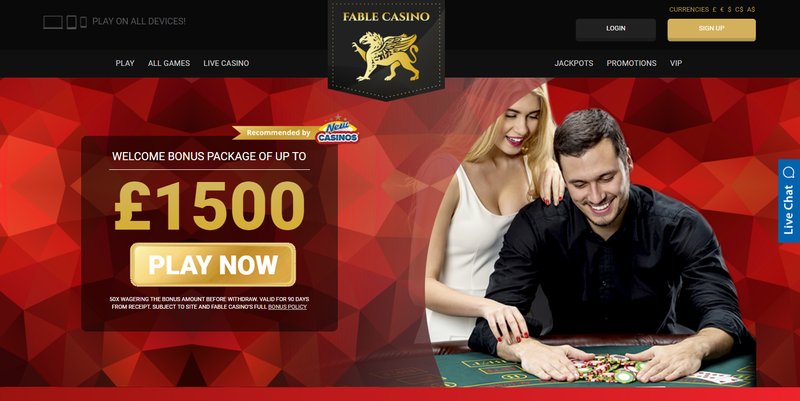 This isn’t just big, it’s huge, and yet another demonstration of Fable Casino’s desire to attract high rolling players. Of course, not every player will be depositing £3,600 for their third deposit, but as long as you deposit over £10, you can claim these bonuses at any value you want up to the limit. Being such a bright, young casino, it’ll come as no surprise that Fable Casino is keeping things fresh with its other bonus offerings. Despite boasting one of the most generous and hefty welcome bonuses you could ask for, Fable Casino also features recurring and seasonal promotions, all designed to swell your bank balance, and keep you entertained. By way of recurring promotions, Fable Casino features its ‘Monday Madness’ bonus. While the name might be familiar to you (many casinos offer reload bonuses on Mondays), Fable’s unique twist is that each and every player gets a tailor made bonus just for them every Monday. Check your email inbox at the start of each week to discover the bonus that awaits you, along with the code that allows you to claim it. On top of the weekly guaranteed bonus, there’s always at least one seasonal and temporary promotion running at Fable, which allows players old and new to get more out of their casino experience. Because the team behind Fable Casino has year and years of experience in the casino industry – both as operators, affiliate and players – they understand how the ‘behind the scenes’ stuff like banking can really make the difference to the way players view the casino, which is undoubtedly the reason that Fable accepts a broad range of deposit options, and makes it super quick and easy for you to withdraw your winnings. When you want to deposit funds into your account, you have the choice of using credit or debit card, PayByPhone, Sofort, Giropay, Neteller, Skrill, PaySafeCard, Trustly, or Ideal. You’ll spot in the mix there a number of convenient and secure ewallets, as well as a mobile phone bill deposit option in the form of PayByPhone. Withdrawing it just as easy as depositing, with players able to use the same methods as they did while depositing to get their winnings out of the casino. As is standard, it takes u to a working day for e-wallet withdrawals to process, while it may take up to 6-10 days for cards of bank transfers to go through. Again, thanks to Fable Casino’s team’s experience, it really knows how to deliver stellar customer service to its players. If you encounter a problem when you’re playing, your first port of call should be the FAQ page, which is one of the most extensive we’ve seen at a new casino. In the unlikely event that your issue isn’t resolved there, then you should head to the ‘Contact Us’ pages of the site, where you’ll find an email contact form, or a link to the instant chat help service, where you can talk directly to a highly trained and super helpful member of the support staff. Want To Play At Fable? Fable Casino is a brand new mobile gambling site full of games, jackpots and promos! Claim Up To £1,500 In Bonuses Now! Fable Casino We quite simply cannot get enough of Fable Casino. The site looks fantastic in its gold and black colours, which give a real sense of class and mystic; a perfect setting for a casino which aims to offer only the best to high rollers. Everything is supersized at this casino, from the massive choice of games, to the outrageously big welcome bonus – you’re guaranteed a great time however you decide to approach it. NextMansion Casino Age Of The Gods £1 Million Giveaway!